No joke, Burger King’s “Simpsonizer” is probably the best movie promotional tool in history. I’ve tried that piece of junk over and over. It rejects pictures after chewing on them for many, many minutes. I didn’t have any face-on portraits, so I took some. It doesn’t like them anyway. Sometimes it claims they aren’t big enough (when they are several times larger than their minimum size). I came back and tried it again just now, and after cogitating for five or ten minutes, it said it was too busy. Hell with it. I’ll draw my own. Yeah, the facial recognition software is pretty bad. 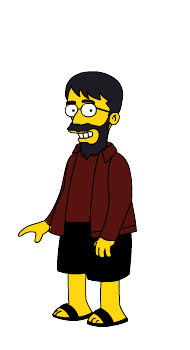 I’m honestly not sure why they make you go through the hassle of submitting a pic; I ended up creating a Simpson Stravinsky (shamelessly linked to my name) by starting with my own picture (which I’d confirmed would be accepted) and working from there. Maybe BK should get that subservient chicken to work on this problem. Now there was an elegantly implemented ad campaign!